Real Networks-backed Rhapsody, as it surpasses the 2 million-paid-subscriber mark, is planning an aggressive marketing push with T-Mobile that includes an all-you-can-eat, advertising-free music service for $3.99 a month, The Post has learned. The service, called Rhapsody UnRadio, which launched in June, is aimed at putting pressure on music-streaming rivals Spotify, with 10 million paid subscribers, and Pandora, with its 3.5 million paid subscribers. Seattle-based Rhapsody, known outside the US as Napster, last released subscriber numbers in April when it crossed the 1.7 million mark. Rhapsody UnRadio debuts as interest in all access music services is mushrooming. Roughly 80 percent of Rhapsody usage is conducted via mobile devices, underscoring the importance of strong telecom partnerships. 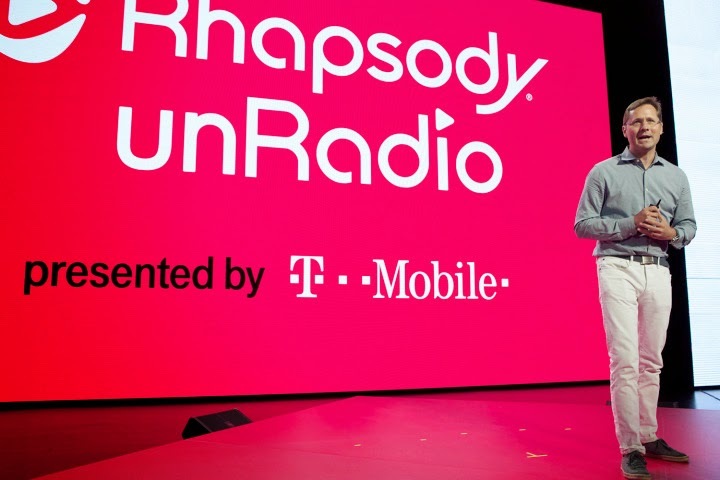 The T-Mobile partnership includes an in-store marketing push that will feature sales staff trained to explain the benefits of an add-on music service, Paul Singer, Rhapsody senior vice president, Americas, told The Post. UnRadio, which can offer up to 31 million songs, is part-Pandora, part-Spotify, Singer said. Customers can chose artists they like for a radio service and then when songs appear that they like, users compile their own on-demand playlists. In addition to UnRadio, a premium service is offered for $10 a month. Rhapsody is also backed by New York-based Columbus Nova, which is also behind music executive Lyor Cohen’s new record label, 300.